Check out our store, we accept PayPal! Every day for two months will transform your body and your life. Yoga is for all ages, all shapes and sizes, all people, all abilities. Yoga is not a religion. It is a health science and will strengthen your faith whatever that may be. 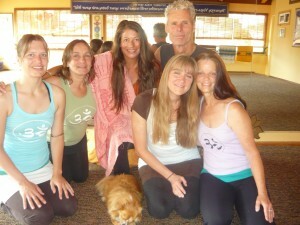 Charles and Peri Ness DeFay have brought their spiritual and loving yoga practice to Point Arena. Everything about the place is unique, inspiring and beautiful. Classes are held in a warm studio, right on Main Street. The flow is scientific and the founders and teachers are committed to bringing the highest level of yogic practice and enabling students of all levels to set intention and grow in their ability, acceptance and power. It is truly a magical and transformative flow, and the Mendonoma region is blessed to have the Yoga Room make its home here. 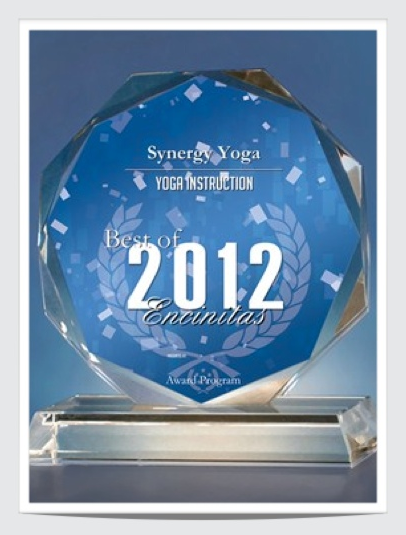 I started the Synergy yoga flow practice about 4 years ago. When I started I had very little experience with yoga. I found Peri and Charles and the rest of the staff at Synergy yoga to be very loving and helpful. It only took me a couple of weeks practicing to feel confident and find a good flow with my personal practice. We all start at different places. It makes no difference where you start, only that you keep coming. I am now in the teacher training program. It has taken my practice to a whole new level. I have never felt better about my personal process in life than i have since starting yoga and especially the teacher training. 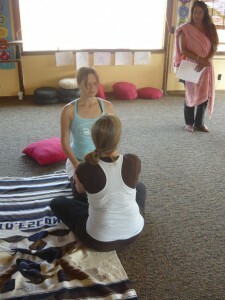 Even if you don't plan to become a regular teacher, the training program deepens your own personal practice. I am so grateful to have found this studio. The space that you have created in Pt. Arena is a magical place. 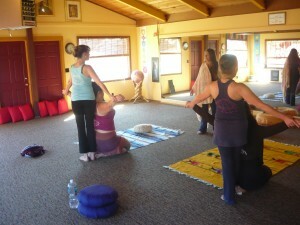 I recently visited the Synergy Yoga center in Point Arena. 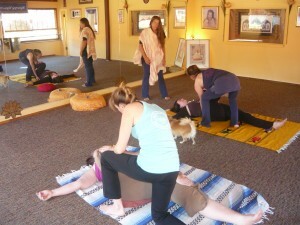 It was the same wonderful and powerful energy I experienced over my 10 years doing Synergy in Encinitas. Peri’s flow and the studios she is associated with have a special energy. It is for me the perfect blend of stretching, meditation, strengthening and release to keep me healthy. During meditation/visualization when we are going to our favorite place on the planet, I go to the Yoga Room, the big room facing the mirror, two mirrors from the East wall, the front row. That is my favorite place on the planet. That is the spot on the planet that changed my life. I have been to Rome, Athens, Tokyo, Hong Kong, New York, Hawaii, Guam, Canada, Mexico, Costa Rica and countless other places on this Earth but the big room, 2nd mirror from the East Wall, front row, is where I found me. My husband and I started the Yoga Teacher Training program together this year. Our first 10 day intensive was April, 2013. What a blessing to witness the beautiful processes that week. 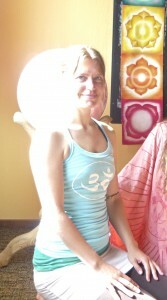 I was so impressed with the transformation that took place in myself and my practice. I patiently await our next intensive this coming November! Entering the Teacher Training as a couple has benefited our relationship, home, family and our personal growth. I feel it is by divine ordinance that we moved here just 4 years ago. Now we have the blessing of Synergy Yoga in our lives. 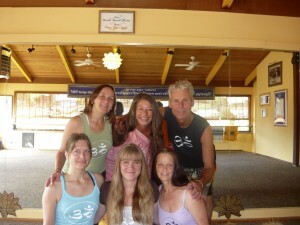 Thank you to Charles and Peri for your dedication, love and constant support at The Synergy Yoga Center. Any chance you'll come back to Encinitas and open a studio? This community really needs a hot yoga studio that isn't just about robotically citing commands so that people get a good workout. Please bring your energy and teaching back to Encinitas. Dearest Peri, what a lovely tribute to your dad. What a handsome guy! I still miss you and Synergy Yoga and have not been able to find a replacement. I am semi-retired, caregiving for elderly clients. I considered my time with you divinely inspired and one of the highlights of my life. Hope all is well with you, Charles, and your little dog. 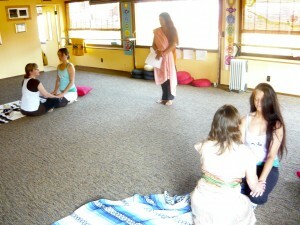 Synergy Teacher Training opened up windows to my heart and soul that had been closed for a very long time. It breathed awareness and feeling into the very depth of my being. The loving guidance and unconditional acceptance of my teachers and classmates created an environment for us to experience the science of yoga and gave us tools to integrate it into our personal lives. It seemed like the 10 days unfolded like magic, beginning with the first moment we introduced ourselves in circle. During that circle time, one of our teachers, Charles, had prepared beautiful cards for us with a single word hand-scribed on them. He placed them face down in the circle. After introductions, he asked us to think about what we would like to take away with us from our training. During my meditation, I thought about openness and transformation. We were then told to go to the middle of the circle and pick a card with that thought in mind. The card I picked was beautiful and it said “Yin.” Okay, it made sense, I am female and yin after all—but I wondered how that applied to opening and transforming. The thought lingered and softly simmered during the training. After the first few days of teacher training, it became clear that eating meals was going to be a problem. 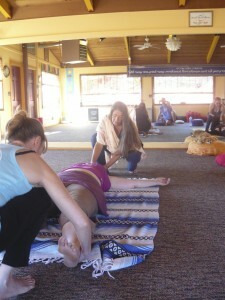 We were taking two classes a day (sometimes) and with a posture clinic in between. I don't like to eat 2-3 hours before a class and our schedule didn't allow for otherwise in the afternoons. So I opted for having tea first thing in the morning and lots of water. After my first class, I had a light snack—usually a smoothy and then didn't eat again until the evening. My energy level was always great and I never had any headaches. About day 3–4 into our training, I discovered that food wasn't really a problem any more because all that I wanted any more was asana and breath. My best yoga classes happened around that time. I felt light and centered. During one class after the final pranayama my whole body felt like it was vibrating and I just wanted to stay in the space forever. 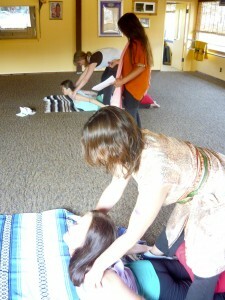 Our teacher, Peri, arranged for our class to go to a Puja, special chanting, and potlach on the second night. It was a feast for all of my senses. When we chanted a mantra that was given to me by my first teacher, Swami Vishnudevananda, "Om Namah Sivaya," I felt like I had come home. At the end of Puja, when we bowed to the alter, I had to think for a moment before prostrating because I didn't really understand all of the sacred symbolism. I bowed anyway for all of the intention that was in the room and at that very moment I felt a shift in the way my heart felt. It felt completely open and at peace. I began to notice somewhere during the middle of teacher training that our teacher, Peri, kept saying "lead with your heart." Unconsciously, I started doing my asanas with that intention on a physical level. However, as we started doing emotional release work with Laura and the Sun Sal process, I made a connection about leading with my heart on another level. It was life-transforming. About three years ago, I started going to therapy to learn how to grieve the loss of my dad. He died when I was a freshman in high school of a “heart” attack. It was overwhelming for the entire family and feelings were buried and not talked about. My grief resurfaced after my kids were born. I had home births with both of mu children and was able to stay at home with them. When they were young, even though I loved being a mom, there was always an underlying feeling of sadness. I remember feeling like I needed mothering and didn't really understand why. As the kids got older and closer to the age I was when my dad died, I became depressed and had very low self-esteem. I still didn't really know why I was having these feelings. I took very good care of my family but pretty much ignored taking care of myself by not getting regular check-ups or exercising. When I finally went in for a check-up, I discovered that I had a lump in my breat and pre-invasive cervical cancer. I was devastated. But fortunately, I finally ended up in therapy. My therapist helped me to intellectually understand my feelings of loss. She gave me an anchor to help me stay afloat. It was by the grace of God that I was also led to Peri and the Yoga Room at that time by way of a friend who worked at the Yoga Room in exchange for classes. Peri took me in under her wing and I worked in exchange for classes. 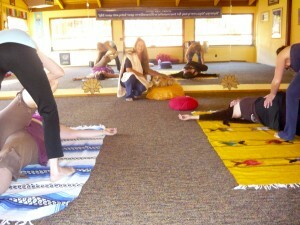 I started doing Gentle Yoga once a week and then progressed to Synergy after a few months. It took about a year to be clear of the pre-invasive cancer. The yoga was also helping me to feel better about myself. 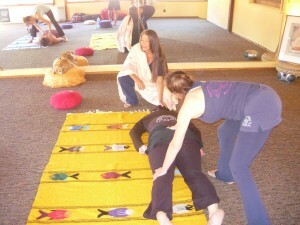 I didn't think that things could really get much better until I took Synergy Teacher's Training. Synergy took me to another cognitive level in dealing with the grief about my dad's death. In a traditional therapy setting, I was able to grieve on an intellectual level. 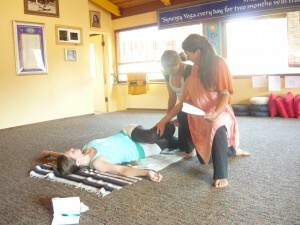 Through emotional processing and asanas, I was able to grieve with my heart and body. I have always been afraid to open up my heart entirely to anyone because of fear of loss; I don't feel afraid anymore of anything including my own security. I feel like I am exactly where I am supposed to be right now. When I look back on the past, I can see how everything that I have experienced has brought me to the point where I am now. I trust that my life is unfolding according to God's plan and feel blessed with his grace. I asked for opening and transformation during our first meditation and received more than a glimpse. Synergy Teacher's Training has given me tools: asanas, meditation, nutritional guidelines, and especially the Bhagavad Gita as a means to further my personal growth on the path. I am optimistic that the practicum will further help me to open doors, integrate what I learned in Teacher's Training, and to become a good yoga teacher. Synergy yoga means "joy" to me! Joy from the inside—from the internal source—the god within. It is different from the joy I feel which is received from an outside source (the outside source where I receive joy is through my family and friends as I experience the God within them). But through the practice of Synergy yoga—which encompasses body, mind and soul—I have tapped into an inner joy that I have been searching for over many years. I have prayed with determination to God & Guru to feel joy about being in this body, as I have spent the majority of my life struggling through the process. Not just about being in the body, but with accepting the coarseness of this earth plain—this delusion. It has been very distasteful to me for a very long time. For the past several years I have been receiving chiropractic treatments from Dr. John Harrison, who has been telling me that "The three greatest Blessings are to have the love for God; to have a Guru; and to have a body." Well! For the longest time I just couldn't feel the Blessing of being in the body—I didn't get that part at all! Then slowly my perception began to shift. I began to hear it a little differently—actually I felt that I was being very ungrateful to my Guru. He has given me so much and I have been whining about it! But the words still stuck in my throat...being in the body a Blessing??!! 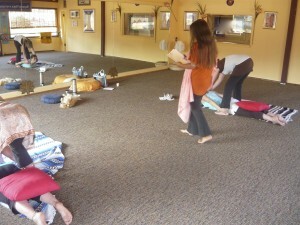 Then came the 10-Day Intensive at the Yoga Room! Peri, you said it would transform my life and it truly has! I love practicing the asanas! They have become a path of self-discovery and healing for me. I know that in order to really heal and release samskaras, they must be released from the body. Through the practice of yoga I am healing...I am growing...I am peeling my onion of delusion. And guess what! I couldn't do it without a body! So, with that, I can finally say that being in this body is a Blessing, and, even better—I have all three of the greatest Blessings! The love for God. A Guru. And a body! So, what does Synergy Yoga mean to me? It means that I finally feel joy about being in my body and on this planet. Right here! Right now! I am forever grateful! The teachers I'm most appreciative and grateful to are first Peri who had such a profound effect on me in my first classes. She actually healed me in one class. I will never forget this. Next would be Miriam who encouraged me to even start this process when I was in such a bad way. Next would be Brenda for not letting me quit when I became discouraged and afraid halfway through the practicum. Then lastly would be Charles for the positive feedback and the encouragement to finish the job. I would also have to include Sharon for being there for me also and showing me so much love through the whole process. Words would not suffice for all these people. Onlu an embrace would really show the love I have for all. From Day One, it is obvious that this Ten-Day program is extremely well thought-out and carried out. The classes, lectures, processes, homework, and breaks all roll out with a logic that's no doubt been refined through experience — but it doesn’t feel rigid. You sense quickly that you are getting the right stuff, in the right order, the right way. I learned a lot, not just about the practice but also about the tradition, context and —most importantly — the true value and meaning of yoga. While Peri Ness DeFay and her Synergy Yoga teachers are very knowledgeable and particular when it comes to asanas and pranayama, their intention and their insights go much further. In fact, the impression that's probably stayed with me the longest and strongest is the positive atmosphere, the supportive interaction — the love, basically — that the staff and this retreat offered us participants. That positive vibe was also generated and echoed by our group, another rewarding aspect of the whole experience. Lastly, I want to say that this is a very comfortable process for men — something I haven't found in some other yoga centers. To begin with, it was a real athletic challenge, and senior teacher Charles DeFay in particular was a big help — a big brother, really. But the female staff was also terrific in their interactions with the guy contingent (there was roughly a 2-1 female-to-male ratio when I attended). That comfort level probably comes from the Yoga Room philosophy (if I can speak for them briefly) that everyone is an “amazing yogi,” as they put it. They’re right, of course... but not everyone puts that message across so convincingly as they do at Synergy Yoga. A big Namaste to them, and to potential students, I wholeheartedly recommend this program. I want to do it again and I'm urging my wife to sign up, too. —John Capouya, New York City; author of "Real Men Do Yoga"
Every single session is GUARANTEED to be life transforming. Oh, yogis, it breaks my heart. The other day a very regular, long-time student who I hadn’t seen in a while told me when I finally caught up with her on the phone that after all the yoga and yoga therapy she did at The Yoga Room, she bumped into a friend who encouraged her to go to other yoga teachers and nutritionists. And this happens so often and I want to remind you that this is the highest and strongest practicing yoga studio. 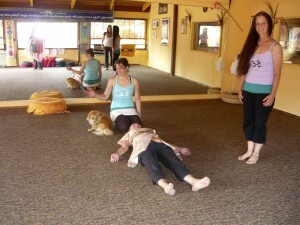 As it turned out, she was directed to ex-students of The Yoga Room, trained by Peri. And the nutritionist was a speaker at the Ten-Day Intensive Retreat way back in the past! 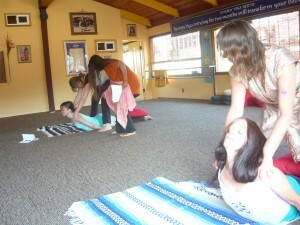 Yogis, our Ten Day Intensive is the next step and the greatest step in your healing and evolvement. The Ten Day Intensive has the cutting edge education on nutrition, relaxation, meditation, ayurveda, physical healing through daily posture clinics, world class chiropractors, and physiologists. You really don’t need to go anywhere else for your physical, mental, emotional and spiritual transformation. Just ask us and trust us when we say the Ten Day is a lifetime of healing and the kind of therapy you receive far exceeds what is out in the world. 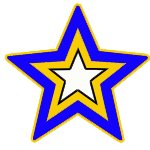 We have the highest echelon of teaching and teachers. We have long time students that have never done the Ten Day and go off and receive therapy somewhere else and it’s just amazing to us. 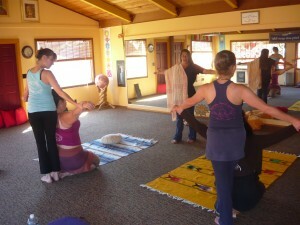 Because The Yoga Room is the leader in yoga, most visiting healers and lecturers pass by our doors or contact us first. We have a great view of what’s flowing in from the universe. We ourselves are rooted in yoga and the world of Paramahansa Yogananda. We are in his town on his corner, on his street and the energy is a force. So do the 10 day soon! We're waiting for you! Love, Roxy. The training was the best thing I’ve ever done in my life. I’m 52 years old and I did this for me, and yet now I feel confident to share my great health and joy from the practice of Synergy with others. It is a professional training, very thorough — with step-by-step practical lessons and deep insights. I have partaken in many other trainings, but this is absolutely the best. It has all the aspects. This experience has changed my life. I went in thinking it wouldn’t be a big deal, just great training in yoga. I will be forever changed because of this 10-day and because of it, I have found my spiritual path again. My experience has proven to me that the best yoga teachers on the planet have been mentored and/or trained by Peri and Charles. I did my training when I was 23 and I wish I had waited, having known nothing, yet thinking that I knew everything. Then I did it again 12 years later—unbelievable! Peri is a true teacher: sweet love, tough love, vulnerable love. THE REAL DEAL. She was the same; my perceptions were different. There is nothing like Synergy Yoga anywhere. It is unique. To Charles my mentor. I have modeled much of my life from his example of discipline and fearlessness, to mediate and to practice no MATTER what. To Roxanne for her fearless example. For "tough love" and never holding back. For giving me feedback on all aspects of my life and helping me grow and learn. You bring joy and light in to my life. To Peri my beloved Master Teacher. Whom ever since I was a little girl have looked up to, and always have aspired to be like. Thank you for teaching me to be a stronger person. for teaching me loyalty, truth, integrity and love. for walking the talk and for being patient with me, for training me and for saving my life by keeping me on the spiritual path. I am honored and humbled to be your student and your friend. Thank you for teaching me how to love and be loved. And to my Guru Paramahansa Yogananda and his unceasing guidance support and protection. For guiding me since my first breath, guided me here, and for our promise of loyalty to each other and his promise to pick me up no matter how many times i fall. 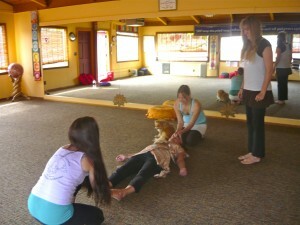 I recently visited the Synergy Yoga center in Point Arena. 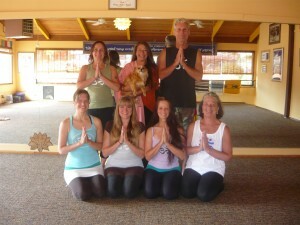 It was the same wonderful and powerful energy I experienced over my 10 years doing Synergy in Encinitas. Peri's flow and the studios she is associated with have a special energy. It is for me the perfect blend of stretching, meditation, strengthening and release to keep me healthy. I have taken many classes from Peri and Peri's teachers - from gentle through to the original heated to the advanced flow and even the 20 minute flow. I do the 5 minutes of sun salutations from time to time when I need to loosen up at work or if I am driving long distances. Synergy has been a major positive factor in improving my life. Synergy meant for me healing inside and out. It helped heal my soul and my spirit and put me on a positive path rather than a negative one. It enabled me to have an oasis of relief from pain both physically and mentally for at least some of my day. It set in motion some of the more positive and enriching times of my life. My first class was Feb, 1999. My most recent was today. My next may be tomorrow. It is the flow. It is always about the flow. Peri is an incredibly intuitive person. She can see when someone is releasing some deep stuff in class. One class early on I remember being in 'the hot box' and feeling a bit peaked. I was in child's pose waiting to come out and continue the flow with the class when I heard the sound of Peri hustling between people over to me. At that moment she placed her hand on my back and said "It's going to be all right" and I fell apart. I had no idea I needed to know it was going to be all right but at that moments she knew I needed to know that. I melted into tears for a while. That was in many ways a turning point for me and the Synergy flow. I realized then the level of release I was experiencing and how much happier and healthier I was becoming. My family started doing YOGA in 1969 when my Father was going through various therapies to cure his alcoholism. My Mom and my Sisters and I did YOGA. I am really the only one who stayed with it. I found Finding Synergy after trying 5 or 6 other studios over 3 years. Synergy Yoga is founded by Peri Ness DeFay, disciple of Paramahansa Yogananda, and teacher of teachers since 1992.